Otaku is a term supposed to be known and understood ubiquitously (Azuma 2001). The number of scholarly and critical literature on otaku or a so-called otaku culture is ever increasing (Machiyama 1989; Okada 1996; Azuma 2001; Honda 2005; Enomoto 2009; Galbraith 2009; Itō, Okabe, and Tsuji 2012; to name a few). What is an otaku then? Judging from the field called “otakuology”, there is no straightforward answer. To be more precise, there are many answers, many definitions of what kind of person an otaku is. In stating this, I already passed the first obligatory gate for the production of otaku-knowledge. Despite the acknowledgement, that otaku are difficult to define (Itō 2012, p. xi) or that encountered individuals do not match the proposed definition (Eng 2006, p. 79), the term remains central in these analyses. A next step in a study on otaku would be to claim that existing knowledge of the otaku is riddled with false representations, like their social inaptitude, and has to be remedied (Okada 1996, pp. 10–14; Honda 2005, p. 8; Nagayama 2005, p. 13). Contrastingly, I am not aiming at criticizing prior representations of a social group called otaku or presenting more correct information. Instead, I will question the hermeneutical value of terms such as otaku and otaku culture themselves. Both terms are laden with contested meanings fostering the tendencies of conflating many different phenomena and actors into one single entity as well as clouding the relationship of explanans and explanandum. As both terms often hide more than they explain, their efficiency as analytical categories appears doubtful. 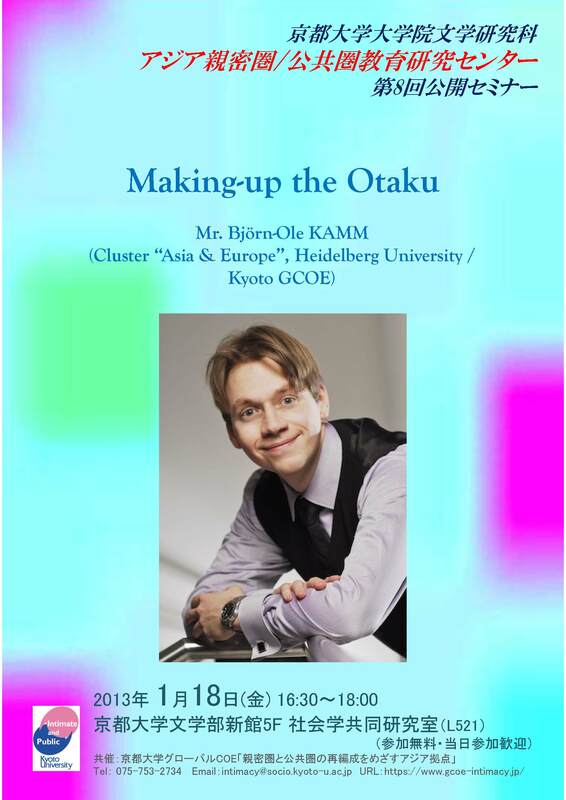 Looking at the otaku as an effect of and a function within discourse, this lecture will focus on the production, the “making-up” of the otaku (Hacking 1986), and the rules governing this production (Foucault 2002). What are the established practices and obligatory steps for producing otaku-knowledge? Particularly conspicuous is the necessity described above that all statements about otaku must begin with the declaration that otaku are not asocial and incommunicative. How was this rule established? Otaku are produced in many areas of life and through many disciplines: Psychiatry, criminology, psychoanalysis, and most prolific, media and (sub-) cultural studies. This “collaboration” can be traced back to a so-called “otaku-witch-hunt” starting in the late 1980s. Most scholarly contributions in Japanese, English or German mention this mass medial “otaku bashing” which followed the Tōkyō-Saitama renzoku yōjo yūkai satsujin jiken of 1988/89 (e.g. Lamarre 2004, 184; Manfé 2005, 22; Ishimori 2009, 9; Itō 2012, xxi). Because the mass media allegedly called the suspect, Miyazaki Tsutomu, an otaku and portrayed him as the tip of an iceberg of psychopaths, there is need of rectifying this false otaku image (Okada 1996; Kikuchi 2008; Galbraith 2010). I want to open this black box, “the media started a witch hunt”. According to Latour, the term black box is used in cybernetics when something is too complex to be represented or explained entirely. In diagrams it is drawn as a black box, its inner workings are not of interest (Latour 1988, 3). After something has been black boxed you can simply use it as a “fact” in a chain of arguments, which can be easily observed within the field of otakuology. As of yet, a content analysis of the mass media has not been conducted. In this lecture, I will trace a number of key human and non-human actors via the analysis of newspaper and journal articles who co-created a network of objects, ideas and people that would produce a distinct subject position (Foucault 2002, 40) from which to make claims concerning otaku-knowledge. A subject position that I also encountered in interviews with individuals who might be called or identify as otaku. Instead of aiming at general propositions about the otaku, I will focus on contingencies: How was the otaku produced during the controversy of the Miyazaki-jiken? Azuma, Hiroki. 2001. Dōbutsuka Suru Posutomodan — Otaku Kara Mita Nihonshakai [The Animalizing Postmodern. Japanese Society Seen from the Otaku Perspective]. Tokyo: Kōdansha. Enomoto, Aki. 2009. Otaku No Koto Ga Omoshiroi Hodo Wakaru Hon [An Easy Guide to “Otaku”]. Tokyo: Chūkei Shuppan. Foucault, Michel. 2002. Archaeology of Knowledge. London: Routledge. Galbraith, Patrick W. 2009. The Otaku Encyclopedia. An Insider’s Guide to the Subculture of Cool Japan. Tokyo: Kōdansha. ———. 2010. “Akihabara: Conditioning a Public ‘otaku’ Image.” Mechademia 5: 210–230. Hacking, Ian. 1986. “Making up People.” In Reconstructing Individualism: Autonomy, Individuality, and the Self in Western Thought, ed. Thomas C. Heller, David E. Wellbery, and Morton Sosna, 222–236. Stanford: Stanford University Press. Honda, Tōru. 2005. Moeru Otoko [The Budding Man]. Tokyo: Chikuma. Ishimori, Shūzō. 2009. “Otaku Ga Nihon No Kankō Wo Kaeru!” [Otaku Are Changing Japan’s Tourism!]. Mahora 60. Itō, Mizuko. 2012. “Introduction.” In Fandom Unbound: Otaku Culture in a Connected World, ed. Mizuko Itō, Daisuke Okabe, and Izumi Tsuji, xi–xxxi. London ; New Haven: Yale University Press. Itō, Mizuko, Daisuke Okabe, and Izumi Tsuji, eds. 2012. Fandom Unbound: Otaku Culture in a Connected World. London ; New Haven: Yale University Press. Kikuchi, Satoru. 2008. “‘Otaku’ Sutereotaipu No Hensen to Akihabara-burando (The Transition of ‘Otaku’ Stereotypes and the Akihabara-brand).” Chiiki Burando Kenkyū 4: 47–48. Lamarre, Thomas. 2004. “An Introduction to Otaku Movement.” EnterText 4 (1): 151–187. Latour, Bruno. 1988. Science in Action: How to Follow Scientists and Engineers Through Society. Cambridge, Mass. : Harvard University Press. Machiyama, Tomohiro, ed. 1989. Otaku No Hon [The Otaku Book]. Tokyo: Takarajimasha. Manfé, Michael. 2005. Otakismus: Mediale Subkultur Und Neue Lebensform – Eine Spurensuche. Bielefeld: transcript. Okada, Toshio. 1996. Otaku-gaku Nyūmon [Introduction to Otakuology]. Tokyo: Shinchōsha.